Purple Paper has infinite uses. In addition to using it as everyday note paper, you can use this printer-friendly paper to create dazzling invitations, letters, announcements, resumes, and more! Great for Valentine's Day and the springtime, Purple Printer Paper is a useful resource for festive arts & crafts projects as well. Our Purple Paper doesn't just come in the standard purple (even though we, of course, have that too). With our great selection you can go for a professional Dark Purple look to a sweet, cute, and subtle look with our Light Purple. Or go super vibrant with our Ultra Grape paper. Whichever you decide to choose, you are sure to make a statement! 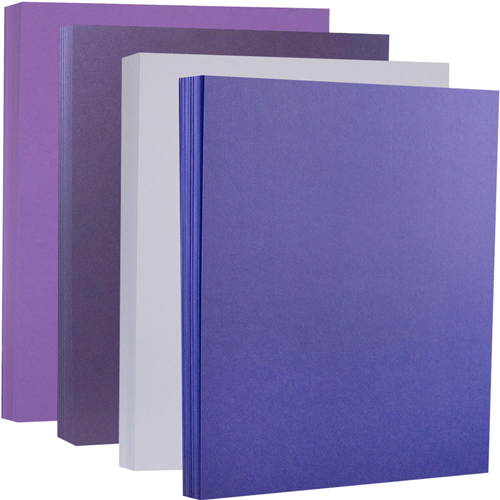 Purple Paper is measures 8 1/2 x 11 (standard letter size paper) and 8 1/2 x 14 (legal size paper). Both have the option of packs of 50 and 100. Want something heavier? Try our Purple Cardstock available under 'Other JAM'n Products You Might Like'!